More Than Just Great Dancing® SFT The Accelerator. The Accelerator is for experienced sales teams that are ready to kick it into HIGH GEAR! 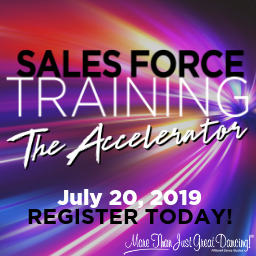 Open to all attendees that have completed Sales Force Training Level 1, The Accelerator is an advanced sales course specifically designed for high performing sellers to get more RESULTS! Go beyond the selling concepts to maximize return on investment, convert massive leads, and supercharge your studio for sales profitability! One of the most intense trainings in the MTJGD series, The Accelerator, will shake things up with proven sales systems used to generate millions of dollars in sales! This 4-Hour Super Session will be a fast-paced, rapid cycle learning environment that will leave you equipped and motivated to exceed your true selling potential! Backed by our Confidence Guarantee, The Accelerator is just $250 per person. This event will sell out QUICK so secure your seat while space is still available!